Here's my deck for the first week. 15 power?! That's a whole lot of confidence you have in the redraw. 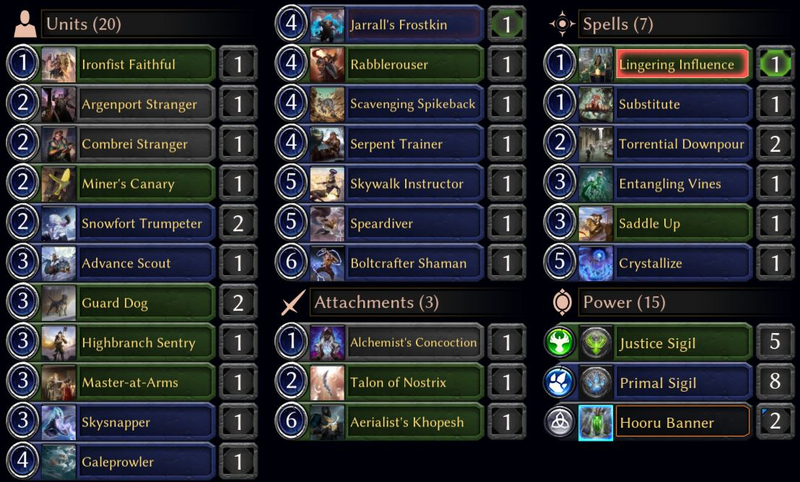 The chance of mising a nice Downpour after casting Boltcrafter does not seem worth having Boltcrafter in the deck, otherwise looks like a solid tempo game. I'm counting Lingering Influence as a 16th power. And a previous version of the deck included Privilege of Rank, I'd swapped that out after my first ten games. Work in progress, we'll see where the next two packs take me. You're probably right about Boltcrafter. Why are the theme decks so bad? I only buy them to explore mechanical concepts and fill out my collection. They should sell the previous year's tournament winners like FFG does. Crystallize remains as busted as ever in sealed. 8-2 in the first week with Hooru Fliers and Stuns. My initial pool is extreme garbage. Squeaked out 6-4, but not sure I can imagine 2 packs of Dusk Road helping things in week 2. I have one, in a sorta Elysian Fliers deck. The deck doesn't seem very good, tbh. I'll see how I do. Average Card Quality is relatively high, but just to flesh out the deck I'm in the awkward position of "splashing" low drops. And for all my removal, it's almost impossible for me to actually get Direwood Beastcaller through, so I'll probably ditch it ASAP. I definitely had it egregiously misbuilt at first and started 1-3, so this may be better than a 6-4 deck, but the variance is high and all my X/1s are terrified of facing Tynnan and those Downpours. That looks like a strong pool! You're right about the high average quality, just need some filler for consistency. I bet it's better than its record, given the first four games weren't with the final build. 1. I hate how often games seem to come down to who got good rares from the curated packs. 2. That the curated packs come from the same person is often very distracting, as you tend to see excellent cards in factions completely opposed to where you started. 3. I have seen a number of absolute maniacs who drafted Merchants, then put their rare bombs in the Market. Did they just have a surplus of rare bombs and I died too soon to see them all? 4. One of these days Justice won't be the defacto best faction to start in. But I think it'll take a Judgment style "anti-Justice" set to get things headed that way. 5. With the above in mind, pretty much any time I face off against high Masters opponents, they're playing Jund or Naya. This gives the format a very boring "samey" texture. There are cool things to do (like the time I had an engine going with Inquisitive Crow and the elf that discards spells to draw 2), but they take a backseat to your bread & butter of (good) removal and bombs. I was really hoping this set was going to be a single-set format, but alas. Maybe next time. 4-1 so far with this Sealed deck. Performs nicely. Needs a little more top end finishers in a perfect world, but Changeestick fills that role nicely. I think you should switch the Umbren Thirster for the Hair-Trigger Pistol. You don't really seem aggressive enough that the Pistol is what you'll need as often as you just want a solid body with lifesteal. Yeah you may be right. I was also considering cutting Entangling Vines entirely for Thirster. I was off Thirster mainly because my only way to get lifeforce triggers for it is units hit by Lifespeaker. I also just want to say that Guard Dog is a Very Good Boy and is a really great common. The power level of the commons in this set really make it feel like they spent a lot of time trying to make this a decent draft focus set. Seems like they wanted to pull some power down into commons from uncommons and rares. Sorry, I assumed there were tourney's. I mean the events might count. FFG makes packs consisting of the previous year's tournament champion decks. Direwolf has mentioned upcoming announcements about official tournaments in some capacity. I'm not sure if the game is officially out of Beta, but a lot of the UI was greatly improved in the months that I wasn't playing. I get how the Recurring Nightmare combo works. My question is how does the defending player still have 20HP after taking 11 ping damage with an empty graveyard and no lifesteal units (Geomar requires a spell to be played). The combo player also has a 0 cost torch in their yard so 14 damage? I hate Recurring Nightmare so much. Now I'm bitter that Purify is not a Fast Spell. As predicted, The Dusk Road did not improve my Event deck in the slightest and I think I'm ready to resign after losing to a person running 3 Harbinger's Bite. 14-6 after two weeks. 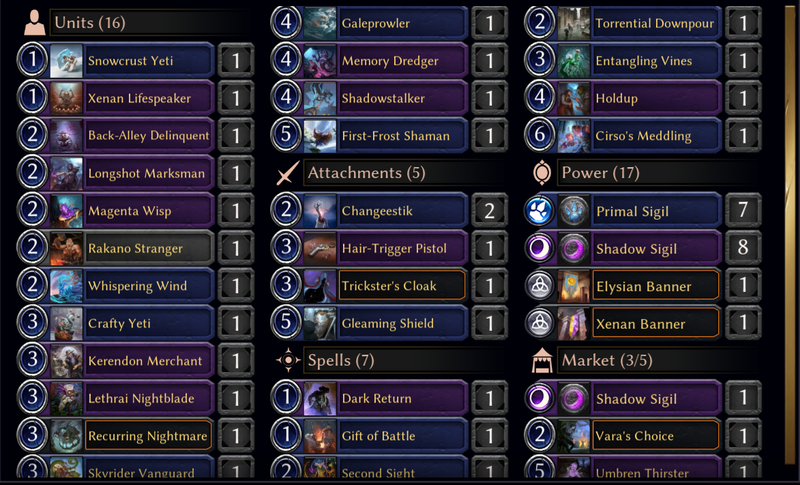 Week 2 was much more difficult than week 1, I ran into several opponents with completely absurd decks. My pool wasn't improved too much, though I did get to swap in a Copperhall Porter and add a Time splash for an Auric Record Keeper, with pretty good fixing (multiple strangers and a Combrei Banner). I'm on full tilt. No matter what I netdeck, or what I face, from aggro to greed, my opponents are invincible. I'm taking a break. 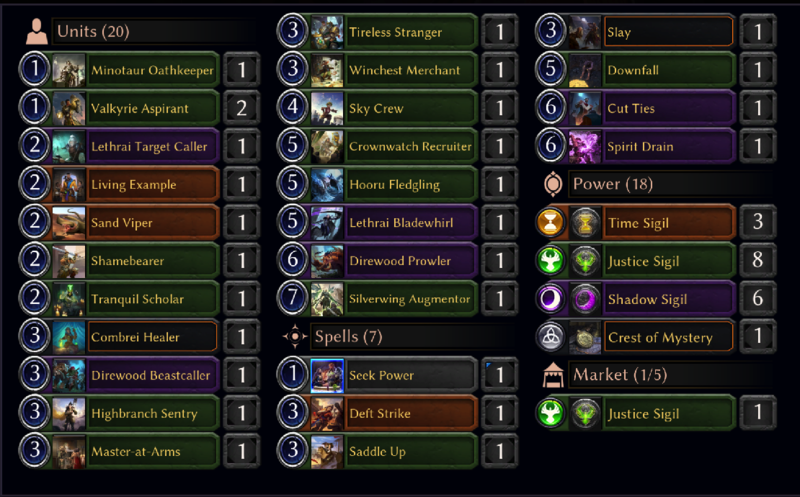 Can’t speak much to Ranked as I’ve barely been playing it - just enough to grab my pack of the day - BUT holy heck am I loving the draft format. It feels so much better than Set 3 did (which is my only experience with Eternal previously). 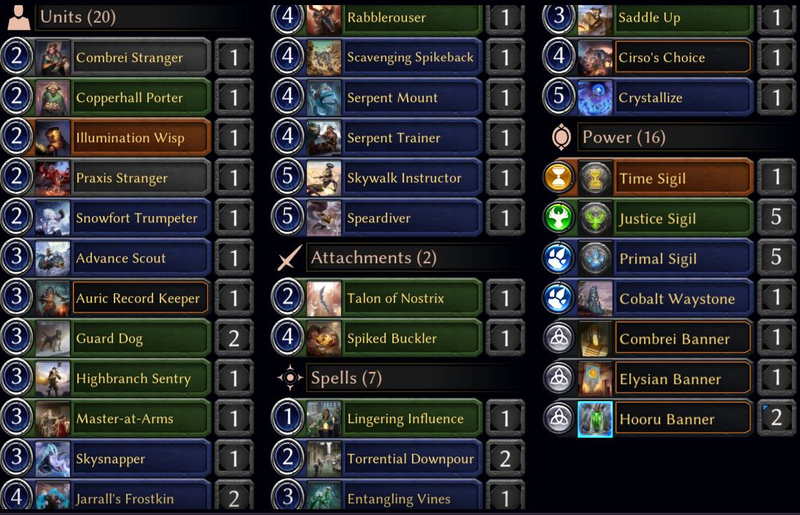 I’m certainly not drafting perfectly and I’ve had a clunker or two, but the gameplay seems a lot more fun and more importantly the DRAFTING seems so much smoother. In Set 3, I was rarely able to find my lane always missing the right components of whatever tribe I thought I should be. This has felt a lot more fun! While I like this format much more than both Omens and Dusk Road limited, I still think I'd prefer a a true single set format like we had with Eternal Throne. There are obviously a lot of reasons for the use of Curated Packs, but I think the passing structure exacerbates (rather than improves) previous issues with reading signals: you'll often be dedicated to 1.5 colors in pack one, and then be drawn in a totally different direction pack 2, and then have pack 3 be a complement to pack 2, only to then end up back in the colors of pack 1. It can make a lot of drafts feel bad and off-the-rails, even when they're not. And tons of the strong players I encounter are just drafting 3-faction good stuff, and to me that's not an indication of format with a distinct identity. That was fun, did my first two drafts tonight. (VOD here if someone really wants to watch it.) The first was a bit of a train-wreck, going like 0-3? Maybe I won one in a fluke. I honestly forget. But the second ended up going 5-3, so that made up for it. This was what I was running at the end. I think so? It has Alessi in it. And yeah it feels like a hybrid between Infect and a Kiln Fiend style deck. I'm on the fence between crafting Hooru (orTJP) Berserk vs Feln Berserk. Fear of (unconfirmed) set rotation has me iffy on crafting a full set of Midnight Gales and neither Gale or Geomar seem great outside the berserk shell. Too many decks. Never enough dust. I think having a significant number of MTG pros on the team would suggest a rotation just means more formats. That said, Geomar seems the safer investment due to being single faction and of a sure-to-be relevant unit type for some time to come. e: cards added for this week were 1x each Illumination Wisp, Frostkin, Spiked Buckler, Serpent Mount, and Cirso's Choice, and the Elysian Banner swapped in for one power. I forget the specific cards I cut but it was generally chaff that made way for the new inclusions. Illumination Wisp might be a bit loose but I wasn't seeing anything I wanted more in the pool. The way this deck plays, it acts like an all-in counterpunch deck that chips away with a few fliers, then induces the opponent to swing out and then locks down their blockers for a lethal crackback. It's been remarkably consistent at enacting that plan, too. After a miserable week 2, week 3 didn't really add much (a Beastcaller's Amulet, 2nd Direwood Prowler, and a 1/5 Endurance Warcry), but I managed to pull out a 7-3, so at least I'm in the positive. It's kinda impressive that the only rare I'm actually now playing is the goddamn Green Merchant. At least this week yielded a decent chunk of dust courtesy of Shogun of the Wastes. Repeat after me: Rain of Frogs is not a good card. Rain of Frogs is not a good card. Rain of Frogs is not a good card. See also: the poor Feln Control player who turned my Icarias and Rizahns green and lumpy, but then never drew their own win condition so they got to watch me slowly bash away with a few Auric Runehammers. If anything, it's what the Market is intended to support, something to maybe fetch against Channel the Tempest decks. But anyone with any sort of MTG experience knows those cards are more trap than anything else. I'm reminded of various spoiler seasons when the inevitable "snag a card from $enemy's graveyard and then remove all copies of that card from their deck and hand", and you can immediately tell who knows what they're doing and who doesn't based on how they evaluate it. Yeah like.. Surgical Extraction type of effects are ONLY useful against VERY specific kinds of combo decks that can’t win without a certain card. And even then you have to have to extraction effect AND the card has to be in the area to effect targets. Continuing with the mtg analogy: Like in theory Storm is a great deck to bring in a Surgical effect against. Hit the right card (For Example, Grapeshot if your a deck we don’t bring in empty against) and we can’t win. But you know what? In all my Storm games I could probably count the number of times Surgical beat me in one hand. "There are no bad threats, only bad answers"